.Quiltscapes. : Shall We Gather III ~ Elastic & Shirring! Shall We Gather III ~ Elastic & Shirring! Welcome to today's Cutting Corners tutorial, sponsored by Riley Blake Designs! 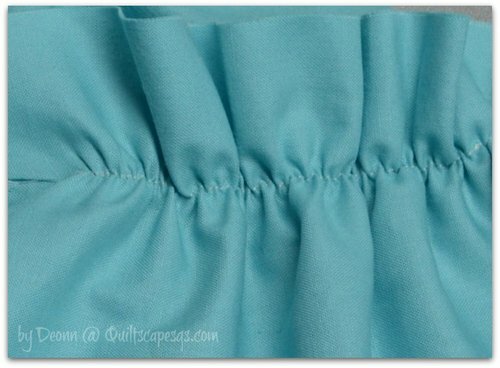 Here's a slick little tutorial to continue my sewing basics series, "Shall We Gather?" 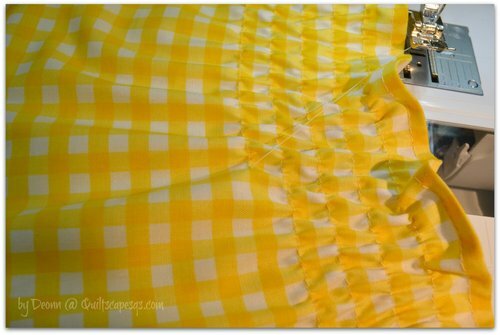 And just in case you missed the previous lessons, see Lesson I for tips to create beautiful gathers with your sewing machine. Lesson II teaches the fun vintage art of Smocking. 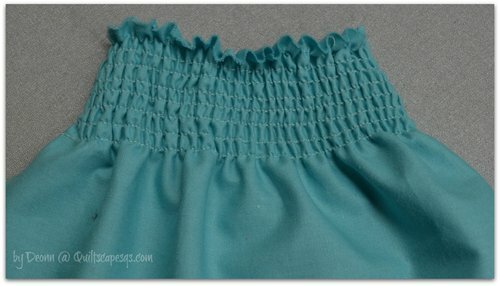 Today, we'll take a brief look at the use of regular old elastic, try a little bit of elastic ribbon, then we'll use elastic thread for another great vintage technique: Shirring! 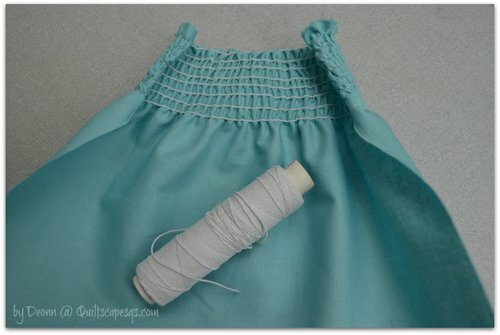 At the end of today's lesson we'll make a sweet little dress with this technique. Fabric swatches, 1/4" elastic, RBD elastic lace ribbon, elastic thread. Cut a piece of elastic the size you want. Pin or baste one end of the elastic to the wrong side of fabric at the beginning edge. S-t-r-e-t-c-h the elastic to the other side of fabric. Relax the elastic a bit, taking up a few little gathers if necessary, then begin stitching. Hope for the best as you try to a) keep the elastic straight, b) keep your stitches even and straight, and c) make it to the end without running out of elastic. Good luck with that! 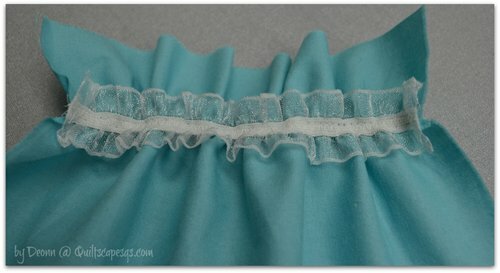 Next, we'll try the same technique with this pretty little Riley Blake elastic lace ribbon. 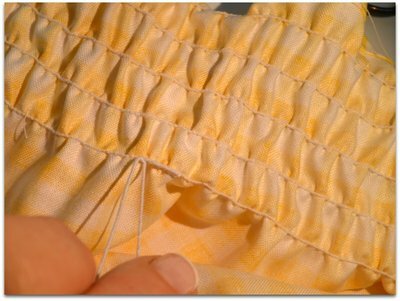 Use a zig-zag stitch through the center of the lace. Apply elastic lace to the front of the garment to create fun look. Use around a cuff, collar or neckline. Most common problem with both these techniques? Running out of elastic before you reach the end. Especially if the fabric where you're applying the elastic is more than 2 X wider than the elastic. Fold over an edge of fabric and stitch a channel to feed the elastic through, or create a casing with another piece of fabric. In this case, I used single-fold bias tape. I like using my edge-joining foot then move the needle position to get a close, even, straight stitch. Thread elastic through casing using a bodkin or safety pin. Tip: Attach a pin to both ends of elastic to prevent pull-throughs! Pin into place, then baste along edges to secure until enclosed into a seam. 3) Shirring. OK, now we'll use elastic thread for the next technique, definitely the easiest approach for gathering with elastic. Look for this product near the elastic section in fabric stores. Experiment to find which brand works best in your machine. The elastic thread is wound on the bobbin, with regular thread stitched on the right side of fabric. Use this application for gathers at a waistline, neckline, cuffs, bodice, anywhere! Wind elastic thread on bobbin. Don't overstretch, but don't wind too loosely, either. ...then with the bobbin-winder directly from the spool without lacing through the tension guide. Worked great on the Bernina, which has a front-load bobbin case. 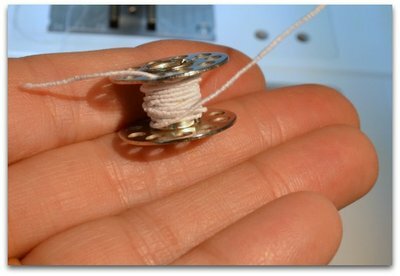 Bring up elastic thread, just as you would for regular bobbin thread. Be sure to leave a good size tail for starts and stops. Adjust stitch length for a longer stitch, about 3.5. Work on a flat piece of fabric for best results. 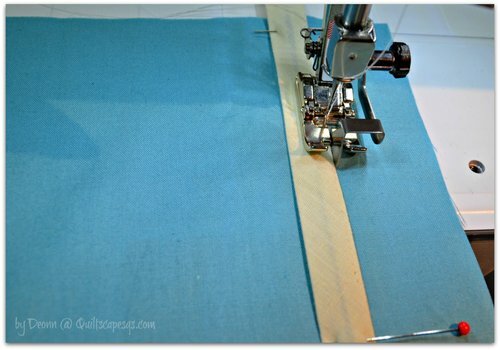 * Determine where you'd like your stitches to start, then begin stitching on the right side of fabric. Elastic thread will be on the back side. Backstitch a couple of stitches, just as you would do at the edge of any garment seam. Stitch in straight rows, 1/4" to 1/2" apart. 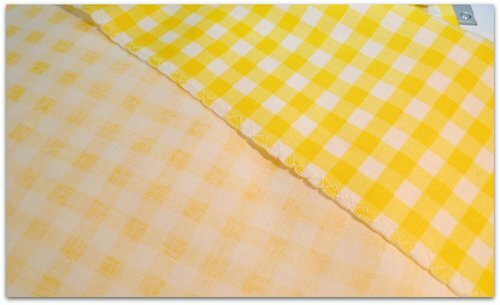 (Easy to do if your print has a pattern or line to follow, such as RBD Cotton Gingham prints!) 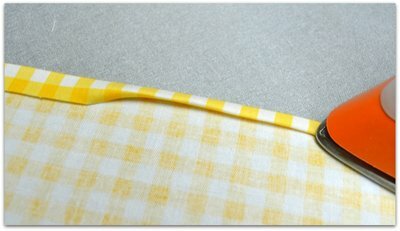 Mark lines on the fabric, or use the edge of your presser foot to gauge the distance. Try using your seam guide bar attachment on the presser foot for consistent spacing. 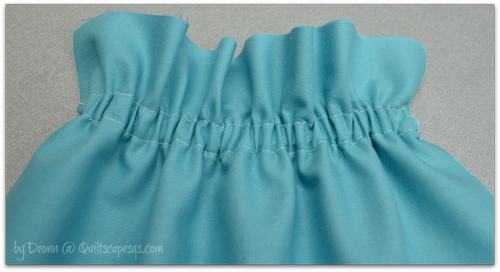 Flatten the fabric in front of the needle so it doesn't stitch unnecessary pleats. When you get to the end of a row, pivot the needle and travel to the next row. Continue until you have the number of rows or width of shirring desired. Example: 2-3" for a waistline or cuff, 1-2" for a neckline, 6-8" or more for a bodice, etc. ?? What if the bobbin runs out in the middle of a row? Clip the threads, wind a new bobbin, then continue stitching, overlapping the end of the previous stitches about 1/2". You could also tie a knot in the elastic if you wish. ?? What if it doesn't look like it's doing much gathering? The more rows added, the more the gathers will tuck in. Once the shirred rows are stitched, use an iron on steam setting to shrink down the elastic. Be careful not to flatten the shirring as you press. 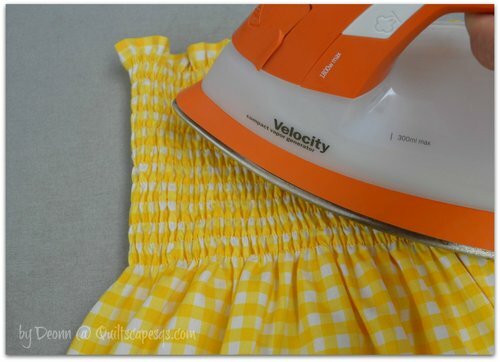 If you don't have a steam iron, spray a little mist then lightly press. The elastic will shrink the stitched area to about half of it's original measurement. 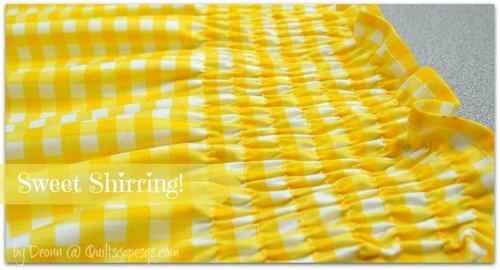 Now, let's make a Sweet little One-Seam Shirred Gingham Summer Dress! 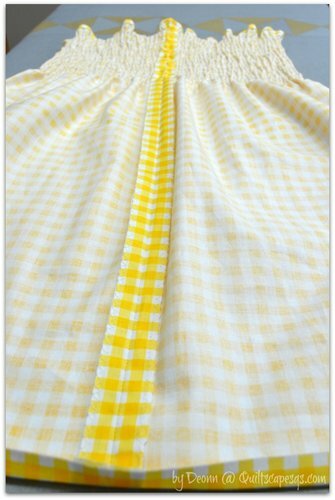 * Gingham print with squares measuring 1/4"
Measure chest of person for whom you are making this sundress, then double that measurement, plus 1" for the back seam. That is the width measurement. Measure from armpit to length desired. Add 1/2" for top hem plus 2-1/2" for bottom hem. That is the length measurement. 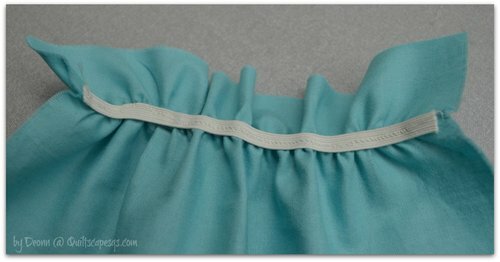 1) Clean-finish side seam edges (short sides) using serger or zig-zag stitch. 2) Finish top hem. PRESS top edge under 1/2". Tuck raw edges inside fold and press again. Edge-stitch by machine to finish. 3) Bottom Hem: PRESS bottom edge under 1/2". You will finish hem after dress is fitted. 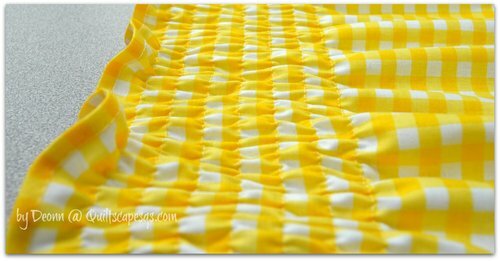 4) Shirring: Beginning 3/4" down from the top edge, stitch horizontal rows using elastic thread as described in the steps above, as many as desired. Backstitch at the beginning and ending; clip threads. 5) Fold shirred fabric right sides together. Match print or plaid, and stitch center back seam, using 1/2" seam allowance. 6) Using a steam setting on the iron, steam shirred areas to shrink down elastic. Do this around the perimeter of the dress. 7) Fit dress. Measure for shoulder straps, then cut two lengths of elastic lace ribbon. 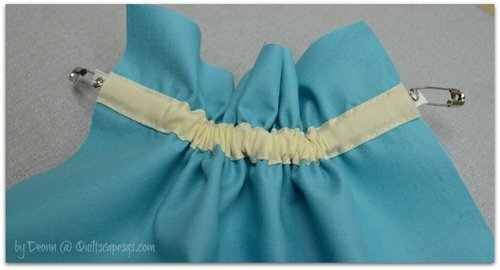 Fold ends under and stitch in place along the top line of stitches at the front and back of the dress. 8) Turn up the hem; pin in place. Hand- or machine-stitch to finish. 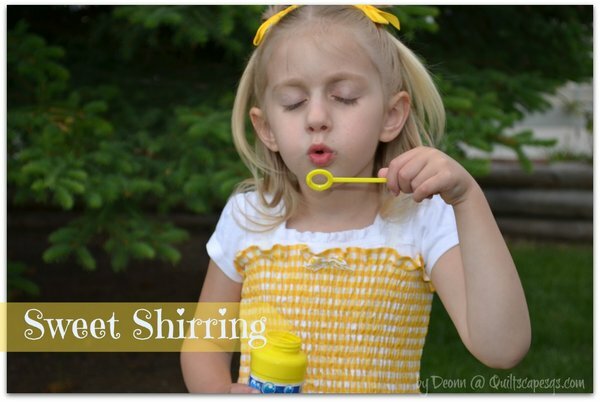 "Shirr" hope you enjoyed this tutorial! Next time we'll finish the "Shall We Gather" series with a little lesson on Rouching - oooh, how exciting!! In the meantime, enjoy your Summer! 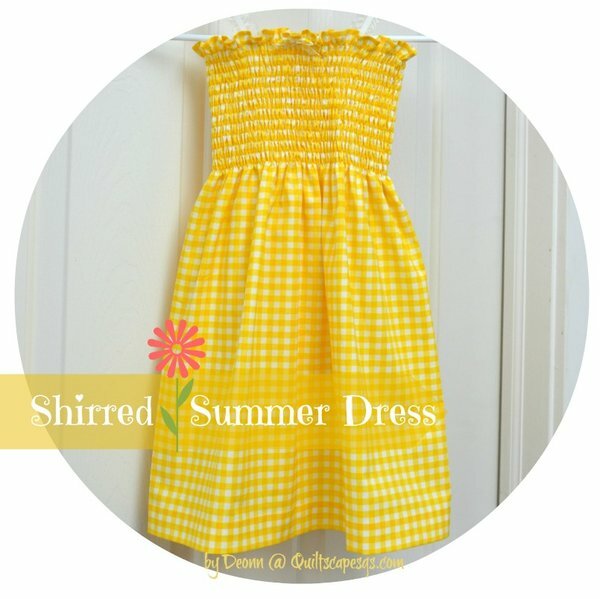 oh my ....is that yellow gingham....is that a tube dress..we use to call them...my girls loved these when they were little....you made it look so easy so frilly so girlish...yes love it... and side note...why don't we get these in an email blast like RBD videos...I want to know the minute these come out....yes that would be very nice... I believe many would love to see this..
June 03rd, 2014 at 10:40 a.m. Very useful pictures and words for me. Thank you. June 03rd, 2014 at 12:43 p.m.
July 21st, 2014 at 5:18 a.m. 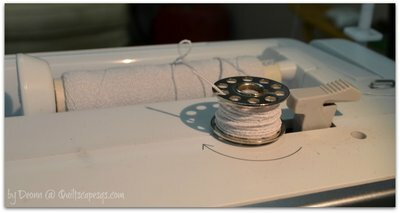 Tried this technique once and could not, for the life of me, get my sewing machine to stitch with the elastic thread wound on the bobbin. Tried winding loser and tighter, but no luck. 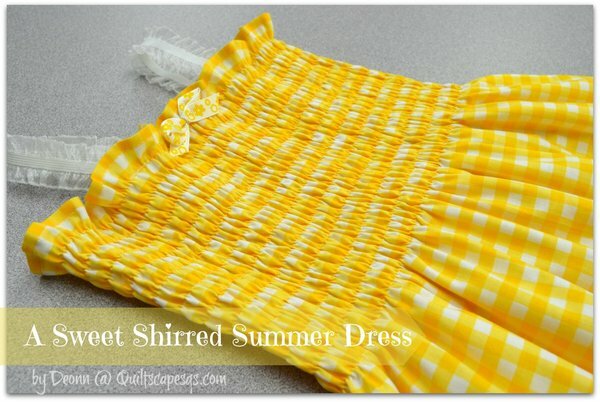 Your yellow gingham little dress makes me want to try again. Love it! August 17th, 2014 at 11:42 a.m.